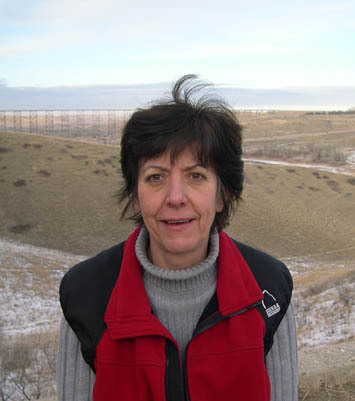 Dr. Hontela conducts her research through the Water Institute for Semi-arid Ecosystems (WISE) at the University of Lethbridge, in Lethbridge, Alberta, Canada. Appointed a Canada Research Chair in Ecotoxicology, her research program focuses on one of the most important environmental issues we face today - the effects of pollutants (pesticides, metals, pharmaceuticals) on health of non-target species, animals that may be continually exposed to low level concentrations of these chemicals in the wild. Dr. Hontela's general area of interest is Endocrine Toxicology, study of the effects of toxicants on the endocrine system that regulates physiological functions through hormones. Specifically, she is investigating in teleost fishes and amphibians the effects of pollutants on the adrenal function and corticosteroid hormones such as cortisol and corticosterone. These hormones have an important role in metabolism, osmoregulation and the immune function. Some environmental pollutants disrupt the intracellular pathways leading to synthesis of corticosteroids, with consequences on animal's health. Ongoing studies in Dr. Hontela's laboratory focus on health assessment of aquatic species exposed to agri-chemicals and metals such as selenium, in Western Canada and investigations of the mechanisms through which adrenotoxic chemicals interfere with the normal synthesis of corticosteroid hormones. Field studies, together with in vitro bioassays and pharmacological tests are used to better understand the effects of specific pollutants on the endocrine system of fish and amphibians. Data from such studies are needed for Ecological Risk Assessment, the process evaluating safety of new chemicals released into the aquatic environment.